I have an inherited adoration for coffee. Notice I did not say inherent but inherited. I grew up drinking coffee. I did not grow up around coffee but drinking coffee. I distinctly remember my first cup. My grannie fixed my sister and I two tiny glasses of coffee milk (which seemed to consist of more sugar than coffee or milk.) I stretched out my hands and took hold of the cold crystal glass filled with this lovely blonde beverage. My little fingernails slowly etched the scrolling flowery design on the tumbler as I quietly imbibed my very first glass of smoky, chicory coffee. In that one moment, I had unknowingly become part of a treasured ritual I would carry with me daily. I’m not sure if it was the percolating sound of the coffeemaker puttering about or the smoky aroma that beckoned us out of our beds, but whatever it was brought us together in the mornings. In those small hours, we sat at my grannie’s solid wooden kitchen table and visited for the better part of an hour, hot coffee in hand, sharing life together. Now, no matter how far I am from my grannie’s kitchen table, I sit with my morning cup of coffee and the comfort of knowing my loved ones are taking part of the same ritual that connects our hearts. Like Luisa Weiss once said, “Distance means nothing when your kitchen smells like home,” or in my case, coffee. Note: I love using Community Coffee, but If you can’t find chicory in whole bean coffee your favorite whole bean coffee will work just fine for this recipe. Also, the bourbon in the recipe is optional, just substitute 1 teaspoon of vanilla extract if you prefer. P.S. As the granita melts into the cream, the combination creates a lovely, silky latte effect so it’s good to the last drop, even if it melts! Dissolve the cane sugar in the freshly brewed coffee. Allow the coffee to cool slightly. Pour the coffee into a shallow container with a lid. Let the coffee sit in the freezer for an hour. After an hour, take a fork and scrape the ice crystals. Place back into the freezer and scrape the ice every 30 minutes until the granita is fluffy and light. 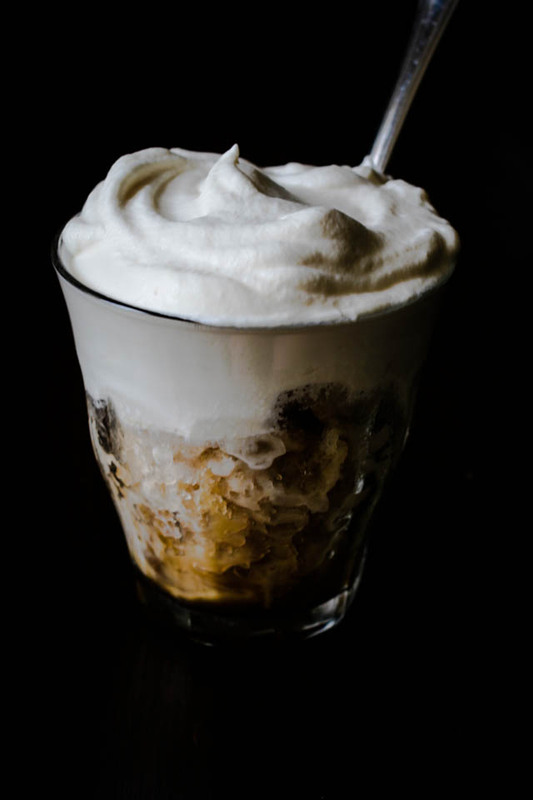 Serve in glasses topped with the Bourbon Whipped Cream (recipe below) if desired! Whip all of the ingredients in a stand mixer until soft peaks form. The whipped cream should be able to hold a slight peak if inverted. Oh thank you so much! I’m so happy you enjoyed such a precious memory I treasure daily! I love the smell of coffee too! The first cup of coffee I had was the same thing! We had coffee with grannie and paw paw for the past few mornings also at grandma and grandpa’s! I love just sitting at the table and talking to them. Great memories! Love you! Love you too! I love how the ritual of drinking coffee brings people together. It’s a beautiful thing. Perfect! I’ll have some waiting in my freezer for y’all! Lovely story, photo, post, and recipe! Just lovely all around. 🙂 I love chicory coffee, too. The metal yellow chicory coffee cans from Cafe Du Monde are my favorite—I feel lucky to be able to find them in my local Asian markets in Southern California. Oh I love Cafe Du Monde coffee! It’s one of my favorites. Thank you so much for the kind words!